Blocked pipes? Broken drains? Tree roots in pipes? Sewerage overflows? Flooding? Then you need a Plumbers R Us pipe relining repair!! Plumbers R Us and its Melbourne Pipe Relining Trenchless Technology, offers another dimension in drain repairs removing the need to dig trenches and excavate sites to repair pipe or drain problems. Therefore does not have any extra costs associated with the reinstatement of finished surfaces (e.g. ; concrete, asphalt, tiles, paving, garden beds, lawn areas, removing of plants and trees etc.). Pipe Relining is a cost effective system which permanently repairs damaged or cracked pipelines and root intrusion to sewer or stormwater pipelines without disruptive and expensive excavation or damage to property. This is done by installing a pipe liner which effectively creates a new and stronger pipe within the existing pipe. The new pipe lining is produced in a continuous length, meaning that the new pipe will be smooth and seamless and will have no joints for tree roots to penetrate. 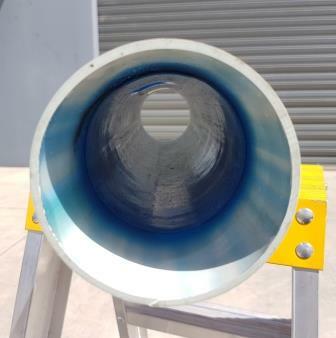 Our CIPP pipelining can be effectively used to stop root intrusion, cracked, broken, misaligned and missing sections of pipes. We can reline continuous lengths or small patches, multiple bends and boundary traps. As we custom make our liner to suit the problem, using the Plumbers R Us relining system, your drain or pipe is ready to be used the same day. The process involves using a CCTV Drain Camera inspection to diagnose the problem and measure the length of drain to be lined. We then use our High Pressure Water Jetter to thoroughly clean the pipe prior to installing the pipeliner. The felt liner is then cut to length and impregnated with resin and inserted into the damaged section of the pipe by either air inversion or pulling in place. Once the resin is cured there is a new pipe in the existing pipe that is now structurally stronger than the old damaged pipe. We can re-open existing junctions using our lateral cutter to reinstate existing branch junctions if required. Our Pipe Relining, combines trenchless technology with years of experience and superior quality materials to provide permanent solutions with minimal disruption and without the need for destructive excavation. We offer a total service that includes pipe reline/pipelining, vacuum excavation, CCTV inspections, drain cleaning, boundary trap replacement and robotic cutting of objects from within a pipe. Trenchless technology allows us to fix pipe problems with little or no digging and reduces the impact of plumbing works usually associated with excavation. Plumbers R Us offers long-term solutions, using high performance materials that are designed to minimise any impact on our environment. The key to our success is our determination to provide the best products, equipment and service possible, and in a timely manner. We use only quality pipe lining materials imported from Europe & USA. Our team are accredited plumbers, not labourers, who work under our own OH&S Policy and Environmental Policy. Every job is important to us. And so is every client. We listen closely to your needs and act on them collaboratively be it a small one-off domestic task or a large-scale corporate operation. Plumbers R Us only employs the best of the best. Our field personnel are all qualified plumbers, not labourers. Cutting edge equipment, often unheard of within our industry. An OH&S Policy together with an Environmental Policy. And understand the needs of our clients. Providing top quality service in our highly specialised field. Creating a bond with all clients from the small one-off domestic task, through to the continuing relationships we have built with regular corporate clients.